After attending the Rotary Club Forum at the Hilton Garden Inn on September 25, 2008, San Diego Union-Tribune columnist Logan Jenkins has made a “2008 election pledge” with Carlsbad city council candidate Glenn R. Bernard. If Bernard winds up winning one of the two seats, I’ll hand-wash his F-150 truck every Sunday afternoon for four years. While the thought of Mr. Jenkins scrubbing his glasses into a fog on Bernard’s truck each Sunday afternoon is wildly compelling in it’s own right, it just isn’t enough for the wacky soccer golfer to get our votes this time around, sorry Glenn. A small single-engine plane has crashed into a small hillside at 7:19 a.m. yesterday September 28, 2008 a mile from the McClellan-Palomar airport killing pilot Guisseppe “Pino” Puzzo, 41, of Lake Havasu City, Arizona, according to a story in the San Diego Union-Tribune. He crashed after canceling an attempted landing in the morning fog and advising air traffic controllers that he planned to circle the airport and try again, Federal Aviation Administration spokesman Ian Gregor said. Though this is the second crash in one week Federal Aviation officials says the crash had “nothing to do with the airport.” This brings total plane crash deaths in and around the Carlsbad airport to 10 in the last two years. The Rotary Club Forum on Thursday evening at the Hilton Garden’s Inn was the talk of town on Friday. Candidate Thomas K. Arnold was particularly impressed with Evan Rodgers. Evan gave an absolutely terrific performance today at the Rotary Club forum. She spoke incredibly well and showed everyone she is not just a single-issue candidate–she talked about art in the village and presented all sorts of other creative, and very viable, ideas. Very smart, very personable, and I honestly believe if she got elected Carlsbad would be a better place. We completely agree with Mr. Arnold, and for the record are liking him more and more as the weeks go on. For more on the forum click the link for the story from the San Diego Union-Tribune. Carlsbad’s mayor, unlike most politicians, doesn’t like to make speeches. Bud Lewis prefers video presentations for his yearly State of the City reports. They’re undoubtedly more enjoyable than the usual drone of self-congratulations. But I wonder if it’s worth sacrificing substance for entertainment value. Was his latest annual report, delivered last month at the La Costa Resort, just another taste of Bud light? Carlsbad resident Christopher Richard Waring, 30, reportedly failed to yield for a San Bernardino Sheriff in the early hours of September 24, 2008 leading to a high speed chase through Hisperia, California. The suspect vehicle continued on at a high rate of speed and crashed just east of 7th Street at a dead end. The vehicle struck a dip in the roadway which catapulted it into the air and then rolled over several times. The driver was ejected from the vehicle. Medical aid responded and the suspect was pronounced deceased at the scene. 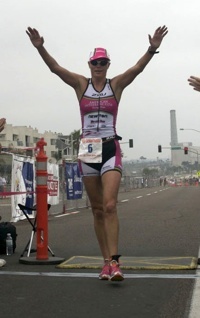 Carlsbadistan’s best hope for the Ironman World Championship Kailua-Kona, Hawaii on October 11, 2008 has withdrawn from the competition after “suffering a slight tear in her right calf” on Sunday, according to a story in the San Diego Union-Tribune. We’re bummed for Michellie and for triathlon fans everywhere. The City of Carlsbad says they have no problem with the location of The Crossings At Carlsbad Golf course even though two planes have crashed onto the property in the last 15 months, according to a story in the San Diego Union-Tribune. Maybe they can just post a sign that encourages golfers to yell “Fore” whenever they see small planes falling from the sky. 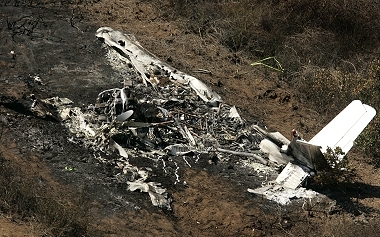 Follow the link for a complete list of plane crashes at McClellan-Palomar Airport since 2002 (there have been seven). Carlsbadistan dentist Richard Allen, DDS of Avia Dental Care just walked away with $175,000 from Fox’s hit TV show”Are You Smarter Than A 5th Grader,” on September 19, 2008. Dr. Allen was assisted in victory by a class of 5th graders and five colleagues from his office, including Carlsbad residents Diana Lain, Susan Milch, and Jordan Davison as well as Amanda Phillips and Dorothy Davis from Oceanside. He opted to take the money and end the competition after being stumped on a question about the first names of early explorers Lewis and Clark. What is he going to do with the money? “I will probably donate it to my favorite cause, the education of my two college-age sons,” he said. 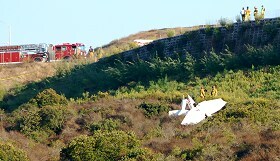 The Crossings at Carlsbad golf course claimed another plane yesterday September 22, 2008, at about 4:45 PM as a Cesna 152 single engine plane crashed into a ravine near the 16th hole, according to a story in the San Diego Union-Triubune. Golfers witnessed it and ran to their aid, carried them out of the plane,” Carlsbad Battalion Chief Jim Torretto said. . . . The pilot, 22, and passenger, 19, had flown from Long Beach in the Cessna owned by Rainbow Air Academy. . . The men, whom he described as alert but confused, were carried out of the ravine by firefighters. A helicopter landed on a dirt lot and took the men to a hospital. They had suffered fractures and cuts. In the past two years nine people have died in crashes after landing or taking off at McClellan-Palomar. 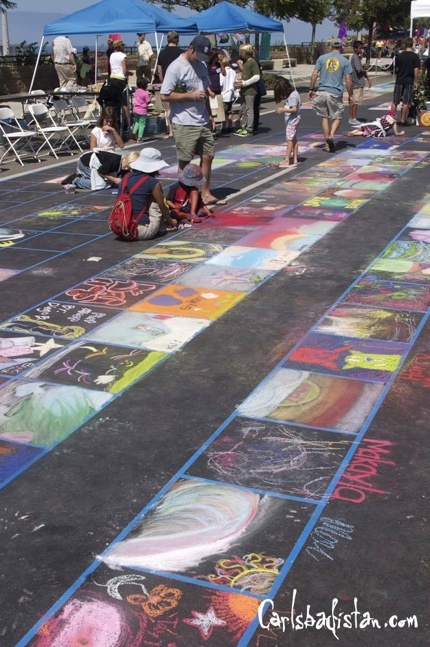 We learned last year that if we wanted to see any of the Carlsbad Art Splash transitory chalk art in it’s completed form we’d have to visit on Sunday afternoon. 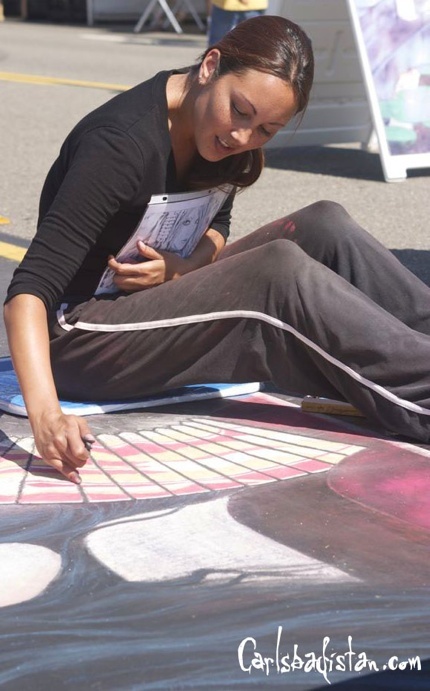 This year we did, however, artists like Jennifer (pictured above) and many others were still hard at work on their pieces knowing full well that they art they were creating would be gone by sunrise. 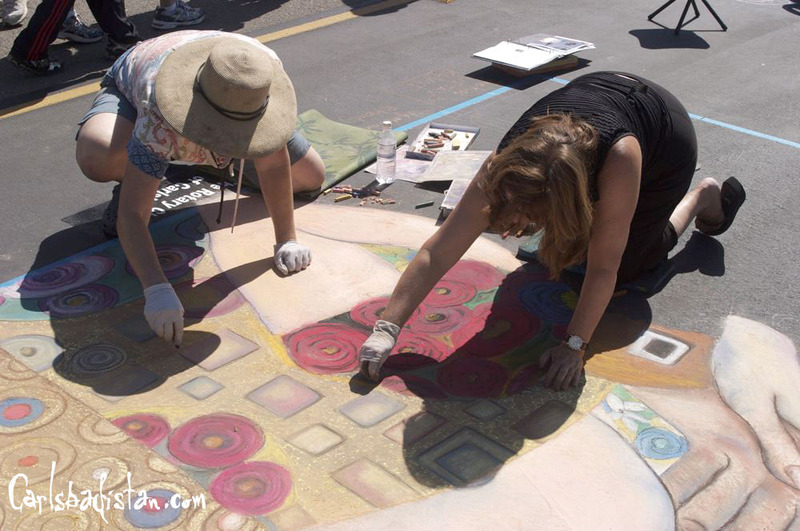 “We have to get all this cleaned up by midnight tonight, because they’re driving on this in the morning,” said Mary Beth McFaul (pictured left) while she worked on the Rotary Club art piece. Obviously, the dozens of artists working on the street enjoy the process over the permanence and that’s part of what makes Art Splash so much fun for the thousands of visitors who strolled up and down Armada Drive this weekend. It wasn’t all spectating. In the Family Art Carnival (below) families were given a square and tools to make their own chalk paintings, make hats out of newspaper, or learn the ancient art of origami. For more photos and activities from Art Splash click the link below.